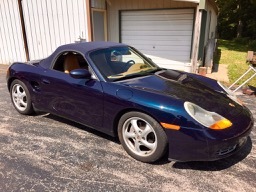 Just purchased a 98 Boxster. I've been a diehard Miata owner for a long time. Even built and raced a Spec Miata for a while, it's sadly still sitting on a trailer. I'm already running into a few issues that I'll post about in other areas but so far I'm very impressed with my new acquisition. Sorry for the late welcome, but welcome! Hope you enjoy your "new" ride. I too opted for a no frills model as it spends most of the time doing daily driving duty with some AX mixed in when I can. Thanks for the late welcome. Been driving the Boxster for a few days then drove the old reliable 92 Miata the other day and I thought the breaks weren't working! The Boxster is a very solid tight feeling car with lots of power and amazingly sensitive breaks but good. It does feel heaver than my old Miata by a fair bit, it's about 700lbs more but the power more than makes up for that. Miata's have nice running gear but the Boxster is more refined. It's got a 5 speed, not sure I'll ever be able to love and electric shifter. I'd have to say there's a lot of insulation from the road. In the Miata I can literally feel the tar filling the expansion gaps in the road. Which after a while is kind of tiresome. However the Boxster is just as easy to place exactly where you want on the road, may be more so. This will be a good love affair. Glad cars don't actually have feelings.